Such wonderful details, Lisa. Love the bit of twine on one of the apples. Perfect stitching. Congrats on the pub! This is gorgeous! LOVING the stitching and those apples!!!! Love that card - and those apples - YUM!!! My favorite part of the season. What a lovely fall card..looks so yummy with those caramel apples. Ymmm, looks good enough to eat! LOL Congrats! Love the design and colors of this so much! Super adorable and tasty looking card! Love all the layers!! I love how you added the twine wrapped around the apple, so cute! 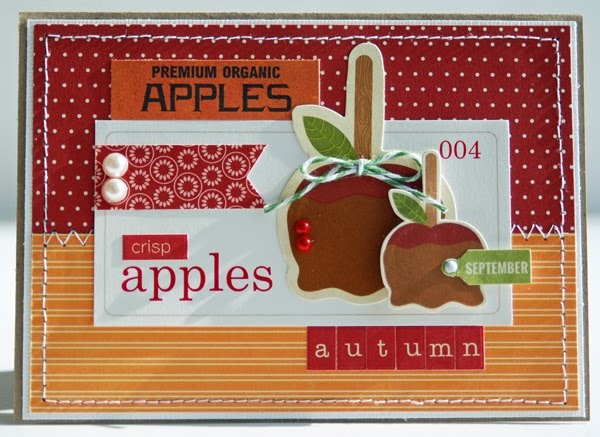 I love the die cut apples with the twine!! LOVE this card! It's so fall, and I just love the brightness of the colors! Love this! So pretty and so darn cute! Love the colors and the stitching! And those apples are just too cute! Fun card. I like the colors! How cute are those candy apples??!! Such a great Fall card, Lisa! Love this Fall card. Love Autumn!! Yummy! You have me craving caramel apples. What a darling card!